Energy storage is considered a key technology for successful realization of renewable energies and electrification of the powertrain. This review discusses the lithium ion battery as the leading electrochemical storage technology, focusing on its main components, namely electrode(s) as active and electrolyte as inactive materials. State-of-the-art (SOTA) cathode and anode materials are reviewed, emphasizing viable approaches towards advancement of the overall performance and reliability of lithium ion batteries; however, existing challenges are not neglected. Liquid aprotic electrolytes for lithium ion batteries comprise a lithium ion conducting salt, a mixture of solvents and various additives. Due to its complexity and its role in a given cell chemistry, electrolyte, besides the cathode materials, is identified as most susceptible, as well as the most promising, component for further improvement of lithium ion batteries. The working principle of the most important commercial electrolyte additives is also discussed. With regard to new applications and new cell chemistries, e.g., operation at high temperature and high voltage, further improvements of both active and inactive materials are inevitable. 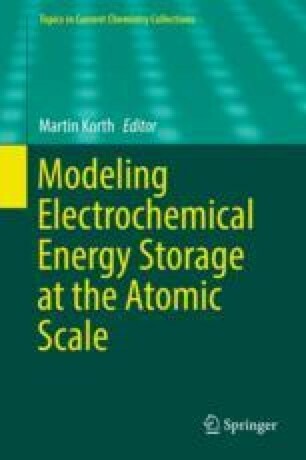 In this regard, theoretical support by means of modeling, calculation and simulation approaches can be very helpful to ex ante pre-select and identify the aforementioned components suitable for a given cell chemistry as well as to understand degradation phenomena at the electrolyte/electrode interface. This overview highlights the advantages and limitations of SOTA lithium battery systems, aiming to encourage researchers to carry forward and strengthen the research towards advanced lithium ion batteries, tailored for specific applications.